What will it take to stop the apocalypse? In most video games, all it takes is to defeat the main villain and save the day. But in some cases, it’s not always so easy. 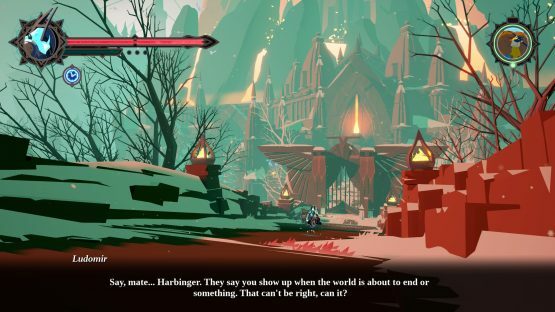 In Omensight not only do you need to stop the world from being destroyed, but you also must find out why an ancient evil has been summoned in the first place. As a result Omensight crafts an interesting narrative, but it’s unfortunately marred by some gameplay issues. Omensight starts you off right in the middle of the action. You, the Harbinger, are teleported into the middle of a bloody battlefield, the climax of a hard-fought war. However, the outcome of the war no longer matters, as the evil Voden has awoken and consumed the world, rendering the feud of mice and birds moot. Thankfully, that’s not the end of the game, as the witch aiding the Harbinger can rewind time one day. She also accompanies one of the important characters in the ongoing war to try and stop Voden’s resurrection. Said resurrection is linked to the death of the Godless Priestess, and it’s up to you to figure out who murdered her and how to stop it. The story to Omensight starts off pretty typically, but it does go in some interesting directions. Learning more about the four characters that can accompany you on the last day reveals some intriguing personas, and things end up not being as simple as they seem. It’s a tale worth seeing to its conclusion, if only to see your comrades react to the information you gather on your quest. In order to figure out the mystery involving the Godless Priestess, you’ll have to continuously replay the final day and learn more information about the world, the war, and the key players in it. Following different characters will reveal new information, and eventually you’ll unlock an Omensight, which is a massive breakthrough in the investigation. Omensights are unique in that not only do they reveal more about the ongoing mystery, but you can show other characters these visions, and change how they’ll go about their final day. It’s important to show the Omensights to each of the characters, but other times it may be best to hold back to gain another’s trust. 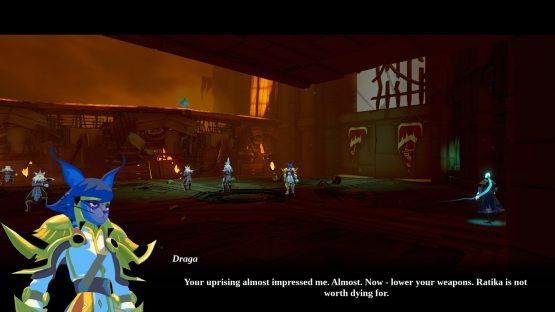 When I first heard that Omensight would feature replaying a day and following characters around as you unravel a mystery, I was really worried that it would become hard to progress, or that I would have to remember a specific set of actions in order to move the plot forward. Thankfully, that is not the case here. The Witch will often offer advice as to who to accompany next, and once you pick a character for a day, you’ll only follow them, and not have to worry about the others. I never once got stuck trying to figure out how to move the investigation forward. 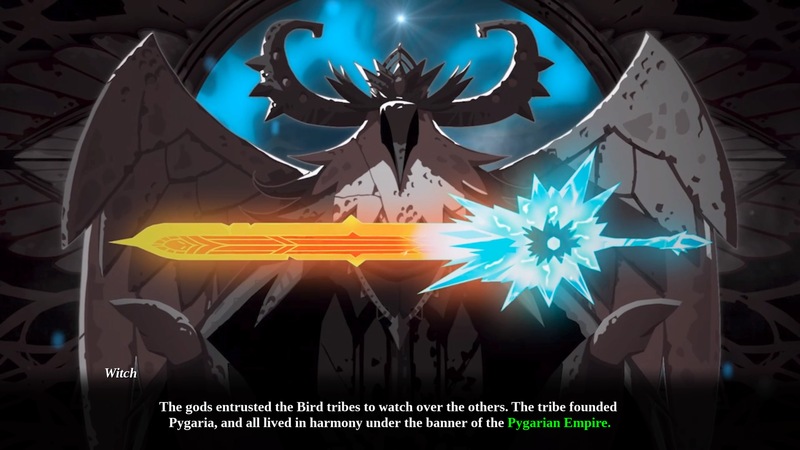 Omensight isn’t just about the story, though. The game is also an action RPG, and it comes with all the bells and whistles you expect from the genre. You have light and heavy attacks, dodging, launching projectiles, and other flashy moves. The thing is, it’s just not very fun to fight. Most battles revolve around dodging enemy attacks, then hitting them a couple times before needing to dodge again. Since the vast majority of battles are with larger sides mobs, you can’t stay in one place for more than a couple seconds without risking taking a hit. Additionally, while you get a lot of different skills to use, there doesn’t feel like there’s much of a need to use them. While I constantly used the move that slowed down time for a few seconds, there are plenty of others, like the grapple technique, that I never felt a need to implement. Finally, Omensight has a fixed camera. It’s a clever enough trick to hide secrets, but in battle there are multiple occasions where this turns into a frustrating experience. The camera might not pan out the way it should, or you might dodge yourself into a sidepath, but without the ability to fix the camera all this means is that enemies are going to be able to take potshots at you while you try to find them. Omensight review code provided by publisher. 1.01 reviewed on PlayStation 4 Pro. For more information on scoring, please read our Review Policy.